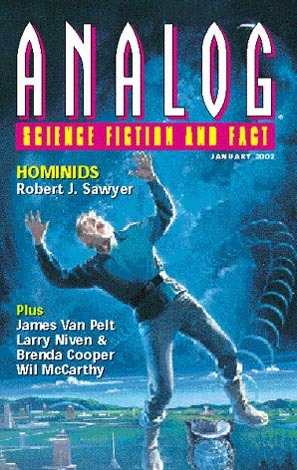 The issue starts with Part I (of IV) of Robert J. Sawyer’s novel ‘Hominids’, and as a consequence the short SF does not start until p.62. Choosing Life. Brenda Cooper and Larry Niven. Short (six page) story looking at virtual life after physical death. An elderly couple have differning views on the digital option – Rafe is keen on the idea of having his neural patterns scanned, whereas Christa is far from convinced. However, Rafe dies before the procedure can be implemented, and Christa has to review her options. Birch Glow. Rosemary Claire Smith. A group of young adults take it upon themselves to commit a bit of eco-terrorism, attacking genmod trees which they believe are threatening to compromise nature. One of the group is captured by the police and finds himself, unwillingly, providing recompense for his vandalism by working on the very same scientific site. In the course of his work he comes to see that things are never quite as simple as they seem, and that the work being carried out may in fact be justified and needed. He ends up face to face with his eco-warrior friends and has to make a choice. Perceptual Set. James Van Pelt. The author has had a couple of good stories appear in recent months (‘The Safety of the Herd’ in Jan 2002 Asimovs, and ‘Father’s Dragon’ in On Spec Fall 2001). In this he provides a tight, tense drama set on board an asteroid mining ship which comes across … something. They pick up images of one asteroid, which appears to have a face on its surface. Initial thoughts that it is simply an optical illusion are replaced by the shattering realisation that this is First Contact. Two of the crew EVA over to the asteroid and start to investigate the chilling construction. Not quite up to AC Clarke-type sense of wonder, but the stories grips as the asteroid slows gives up its secrets. The third of a good trio of recent stories by Van Pelt, all quite different and indicating a good range across which he can write well. A Deeper Rest. Melissa Lee Shaw. A cetacean story. A scientific establishment is experimenting with communicating with dolphins, and their skills come in handy when the military descend in an attempt to find out what is causing aggressive behaviour amongst wild dolphins and whales. It transpires that genmod fiddling has resulted in the cetaceans becoming sterile, and (rather unbelievably) the cetacean population have realised that humanity is to blame and are fighting back. The scientists on the base are able to communicate with one of their dolphins, who is freed to (again unbelievably) talk around the wild cetacean population to giving up their war against humanity. This came across to me as plot-wise being a childrens anime cartoon plot. 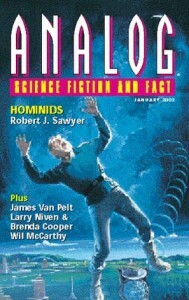 Thin on the ground in terms of number of pages for short SF this month. James Van Pelt’s story is the best by far.